This page is going to be continually updated. Writing a membership guide has been something that I have been considering for years as each time a new member signs up I can spend an hour or so writing a quick summary to the new arrival and, clearly, it makes more sense if I can get it all down in one place. No doubt there will be errors and omissions, so this will be updated constantly, so do please keep popping back. Each evening, at around nine or ten o'clock, the ratings are posted to the Members' Area within the UK Horse Racing site. This image, above, was taken from the Members' Area for the 24th of April, 2018 and this layout will be typical for most days. The difference between the two versions of the Summary Ratings is that one is sorted by Meeting and the other is sorted by Time. The third Summary Rating file is the same as the first PDF but is available for download in MS Word format. The Daily CSV file contains every element of data that can be found within the Detailed PDF Ratings and this is the document that most people download each night. The Data CSV file can be imported into one's own spreadsheet, or database, application and then worked on. I use the Daily CSV file for my daily selections, see here for more details - https://www.ukhorseracing.co.uk/Systems/mksPortfolios.asp. The XML File Collection needs a little more explanation. In the Members' Area there are a number of reports which have been created over the years and are updated each night with the forthcoming racing's data. This example, seen below, is one such report. In this report (for the 24th April, 2018) lists all of the trainers with horses running today that have had at least ten winners in the last five years and have made a profit of 10 points, or more, in that same period. This profit is calculated on having one point backed at SP on each of their runners. The point here is that there's a link, indicated by the arrow, which gives the same data in XML format. There are dozens and dozens of these little reports and listings all over the Member's Area. Some, like this one, will be short and others, such as the ones that list every runner, will be longer. Example of a statistics page within the Members' Area showing the XML download link. All of these XML files are rolled up into one large .zip archive file and, collectively, they are available for download. The first page of each race within the Detailed Ratings matches that of the Summary Ratings. And then, after this, it looks into how the trainers have their form, recent and otherwise. It looks at the trainer and jockey combinations. If the race is run from starting stalls (flat and all-weather) then a stall analysis is given. We also offer in here the Sire and Dam breeding figures which are, arguably, the most comprehensive available anywhere. The full form of each horse is also printed. As a rule each race's information tends to take at least twenty pages in the document to cover it. Larger races such as the Grand National could take three times that number to go through all the data for the race. The best thing to do would be to visit the archives (https://www.ukhorseracing.co.uk/Archives/DisplayFolderContents.asp?Folder=2018#pdf) and to open one at random and to look inside. The Race Listing, the next item on the list, is simply a document which lists the races. Some people have found this useful, though I am not sure what for. But as it seemed a genuine request by some members I implemented it. The next one is the Sire/Dam Report and it gives a comprehensive report of the Sire and Dam statistics. Basically this is an excerpt of this data from the Detailed Ratings and collated here. This is something that interests me and will be expanded in the future. If you've had a look at the links in the previous section to look at examples of the PDF and CSV documents, you've been in the public area of the Archives. This public area shows the documents from only two days each month: this is simply so that visitors can get an idea of what the ratings look like. Members, however, have access to all of the PDF documents and the CSV files. To get into the members' part of the Archives, one has to log into the Member's Area first. When the site's code 'sees' that one is logged in successfully then one can progress further into the full set of Archives. The most important part of the Archives, as far as the members are concerned, are the CSV Results. These comprise of the CSV files for a whole month, rolled up into one CSV file listing every horse declared to run in that month, but with the results included. The members are then able to download this monthly CSV file and use the results data within (which includes finishing position, distance behind the winner, the starting price and the price on the Exchanges at the off) for their own use. The data is there for the members and, as a rule, by about the 7th of the month the previous month's data has been prepared and uploaded for the members. A good proportion of members use the Data Analysis Tool (DAT), https://www.ukhorseracing.co.uk/Tools/DataAnalyst_v2.asp, which uses these CSV files to analyse the racing and look for methods and systems. The DAT is a powerful Excel application (so one needs Excel running on a Microsoft Windows machine) which one can program to do all sorts of analysis that the user wishes. A number of users import this data into their own private databases for analysis with their own software and I know of a few who use this data as feed into their own neural networks. The DAT may look somewhat frightening at first. But it's designed to be rather straightforward to program. There are a number of tutorials on the site starting here, https://www.ukhorseracing.co.uk/Tools/DAToolProgramming.asp. But, even if this is still a little overwhelming have a look at the examples (e.g. https://www.ukhorseracing.co.uk/Tools/DAToolProgrammingExample1.asp) to get an idea what's required. Even if this is no help, or even makes things even more overwhelming then don't worry. The Discussion Group (see below) was built for this purpose. So, join up the Group following the instructions within the Members' Area and then ask questions there. The advantage for using the Discussion Group rather than the Forum is that one can send files back which can be a tremendous help. It is important to note that the ratings aren't sent out via email. This is because the amount of data generated each day is simply too large for reliable email transmission. Therefore, it's best that the member can come into the Members' Area and pick and choose which files to download. If one is looking at this on the Forum, which I recommend, then it will flip over to the date of the ratings automatically as the Forum refreshes every few minutes. Because there is nothing that's guaranteed in today's connected world. Even with the best will in the world it's entirely possible that the web host that I use has lost power and I am unable to upload the data. In this case, and only in this case, I will do a manual posting of the data. When one visits the Members' Area one will see a reference to the Discussion Group. This is an email based discussion group which is handy for this sort of emergency. Normally this email group is for discussion of the data and is useful for members to send data to each other but when the site is unavailable I will post the ratings here. So it is vital that one joins the Discussion Group when one becomes a member. There is a forum which is an essential part of UK Horse Racing. This is the main channel where the members talk to one and another. As the forum is closed to all but the members this means that there is a freedom to discuss the ratings and to share selections based upon the ratings. One of the more wonderful aspects of UK Horse Racing is how the forum has developed. The members tend to welcome sharing of information and are extremely friendly, which is a rarity in the racing world. It would be fair to describe the forum as having a club atmosphere. Because some members share their selections on the forum it's a great place for a new member to start without wondering "Where on earth do I start?" Questions raised on the forum tend to be answered quickly by other members as there's always someone passing through who is able to help. This is a small website and so it must be explained that admission to the Members' Area isn't instantaneous. This is because I do all of the accounts manually, but I do try to get to enable the new member's account as soon as possible. When I enable a member's account for the first time, an extra ten days is added to the expiry date. These ten days act as a kind of 'buffer', as it then gives me these ten days to update the subscription when the renewal comes in. This means then that the member doesn't run the risk of losing access to the site and it means that I can sit down and do the membership renewals once each week. To apply for membership one needs to visit this page, https://www.ukhorseracing.co.uk/subscribestep1.asp, fill in the form. When the form is filled in a payment link is sent to the new member and once that has been made, I will ensure, as I have explained above, that the account is enabled. I don't believe in systems as such. The problem with systems is that they rely on a lot of back-fitting which, even if it lasts for a couple of years, always starts to unravel as time goes on. There is a page under the Members' Area, though, that contains all of the old systems that we have had in the past. Once upon a time these did work on the exchanges but, as time went on, the markets got tighter and tighter and they no longer work. These systems are still being updated every night and there are there for research purposes and there's no recommendation to use them. They are worth looking at for ideas and it's for this reason that they are still there. Then there is the Van Der Whiel (VDW) method that I have coded up. There are people who follow the essential criteria of the VDW and so the scores for the VDW are there for examination and use. We have the Koulds Score (https://www.ukhorseracing.co.uk/Ratings/KouldsScoringSystem.asp), which is an invention of one of our member going under that pseudonym on the forum. This is a scoring system based on the Sire and Dam statistics and this is worth looking at. There will be more research into this in the future. So, if I am not following a system then what am I doing? Personally, I do two things. The first is what I call Cherry Picking. This is simply looking through the ratings and finding some fields on a horse that stand out when comparing to the rest of the horses in the race. This could simply be a Cls rating being around 14, when no others are higher than 4. Or it could be a massive Spd figure which is head and shoulders above the rest. If I find one such horse in a race then I will back it subject to one criteria: that I can get a price that is higher than the Value price. As a rule I only look for Cherry Picks at the smaller meetings and only on the quieter days. This is because I find that I do better when it seems that no-one else is looking at a boggy Hereford meeting on a Monday. I don't consider Cherry Picks for the main races and never on the Friday or Saturday. There are members who do well on these days but I simply prefer trying to find a good value selection that's hidden away in a race in a meeting that the majority of the punting world hasn't considered. But, this is just a small fraction of my selections. If I am having a busy week then it's possible that I won't be looking at the ratings at all. 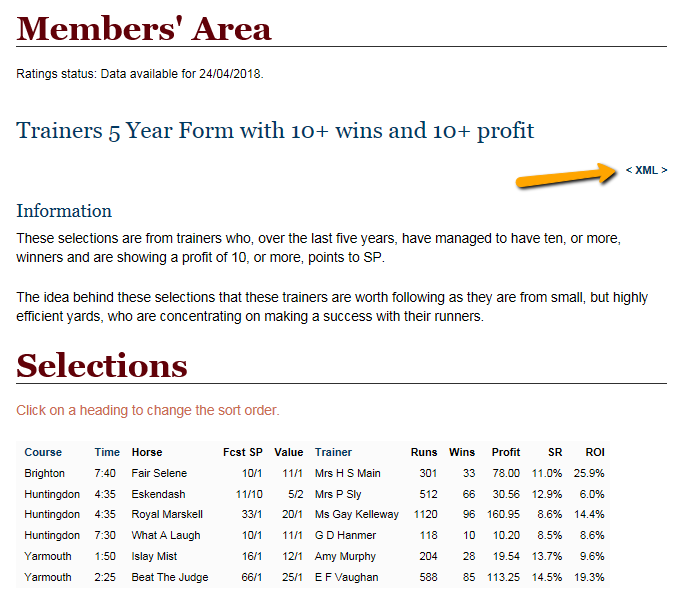 I have placed all possible selections on a web page in the Systems page within the Members' Area. This then will make it easier for anyone to take the selections and then see if they are value. This will be made easier if one uses The BetEngine (https://www.thebetengine.co.uk/) to place the bets as there will be an XML file along with the selections which can be used a direct feed into the BetEngine. As I have mentioned above, the Forum will contain a number of members' selections that involves these value methods and no harm will come by simply following one of these. Our Philosophy describes a little of how we look at things and why things are different to more traditional methods of producing the ratings.